ioSafe is a name that can be trusted when it comes to disaster-proof hardware technologies and devices, and it remains true to its reputation by rolling out the spanking new ioSafe Solo. What makes the ioSafe Solo so special compared to other external hard drives? For starters, it comes with a whopping 1.5TB of storage space and boasts integrated ioSafe disaster protection technologies. The ioSage Solo has been specially designed to be a cost efficient external hard drive backup solution that improves the odds of retaining your data in the event of a fire or a flood. Revealed first at the recently concluded CES 2009 in Las Vegas last week, the ioSafe Solo features both fireproof and waterproof capabilities at CES, much to the amazement of the attendees. The ioSafe Solo won’t hit your pocket too hard either, as prices start from $149 upwards, depending on the capacity you want. Not only that, ioSafe has managed to improve and optimize its external hard drive technology in the Solo, offering exceptional value versus non-protected external hard drives. Your single 3.5″ Seagate or Western Digital SATA internal hard disk drive inside will remain relatively safe and sound, thanks to its patented fireproof and flood-proof enclosure solution. The external case is able to withstand fire temperatures of up to 1,550 degrees Fahrenheit and flood protection down to a 10 foot depth for 3 days, although it would be nice to see a built-in emergency light for people to locate it among the ashes or under murky water. Of course, divers in a flood will most probably look for bodies or those who are half-trapped underwater, but a flashing light would go a great deal in helping them spot your hard drive as well. 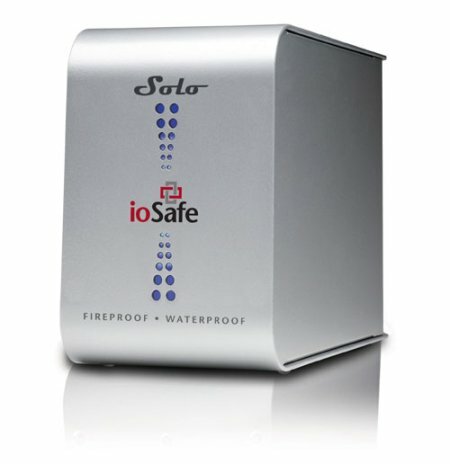 Available in capacities of 500GB, 1TB and 1.5TB, the ioSafe Solo is compatible with PCs, Macs or Linux computers via a USB 2.0 interface. The 500GB, 1TB and 1.5TB ioSafe Solos are going for $149, $199 and $299, respectively. All purchases are equipped with a power cord, USB cable and users guide.